This is a meal we’ve been eating since childhood. It isn’t fancy at all (condensed soup, check! ), but that’s one of the things I love about it. This is comfort food at its finest. One more thing, you have GOT to serve it with peas. It’s the only way. Place chicken breasts across the bottom of a 9x11 baking dish. Pepper each breast generously. Set aside. In a large pot mix together soups, rice, butter, and milk over medium low heat. Cook until the butter is all melted. 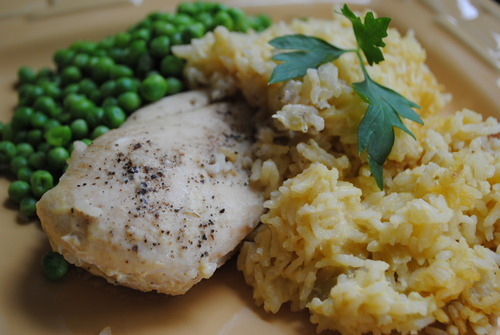 Pour rice mixture over chicken breasts. Use a rubber scraper to help get all the rice mixture out of the pot. Smooth the top evenly. Cover with foil and bake at 350 degrees for 1 hour. Or, you can bake at 300 degrees for 2 hours. When finished baking, remove from oven and let sit for a few minutes. Cook frozen peas according to package instructions. Use a slotted spoon to serve peas. I like to eat the peas, chicken, and rice all in one bite. The bomb, dudes.